IT major Infosys on announced its plans to hire 10,000 American workers over the next two years and open four new technology and innovation hubs across the US. The new hubs will focus on cutting-edge technology areas, including artificial intelligence, machine learning, user experience, emerging digital technologies, cloud, and big data. These four hubs will not only have technology and innovation focus areas but will closely serve clients in key industries such as financial services, manufacturing, healthcare, retail, energy and more. The first hub, which will open in Indiana in August 2017, is expected to create 2,000 jobs by 2021 for American workers and will help boost Indiana’s economy. Infosys is committed to hiring 10,000 American technology workers over the next two years to help invent and deliver the digital futures for our clients in the United States, said CEO Infosys, Vishal Sikka. Learning and education, along with cultivating top local and global talent, have always been the core of what Infosys brings to clients; it is what makes us a leader in times of great change. In helping our clients improve their businesses and pursue new kinds of opportunities, we are really excited to bring innovation and education in a fundamental and massive way to American workers, he added. In filling these jobs, Infosys will hire experienced technology professionals and recent graduates from major universities, and local and community colleges, to create the talent pools for the future. 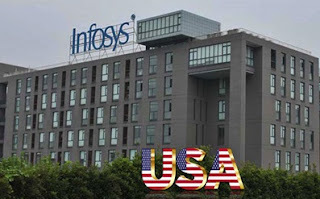 To ensure that American workers are fully equipped to innovate and support clients in the rapid digitization of all industries and consistent with Infosys over 35 year-long commitment to the U.S., the company will institute training programs in key competencies such as user experience, cloud, artificial intelligence, big data and digital offerings, as well as core technology and computer science skills. This development comes as part of Infosys continued legacy of a three-decade long investment across the U.S. In just the last three years, Infosys has renewed this focus by setting up an innovation hub in Silicon Valley. A unique, open environment that encourages new ways of working, collaborating, thinking and delivering breakthrough next generation project to clients.Since joining Infosys nearly three years ago, it has been my personal endeavour to help us get much closer to our clients, to co-innovate with them, on their most important business problems, added Sikka. We can achieve this by enhancing our ability to attract and recruit local top talent across the United States, by harnessing the global scale of Infosys, through software and platforms, and by educating and training people in the necessary skills, he added.